I'm on a sugar high... and boy does it feel good! Today was a fabulous day in Chicago. Sunny skies, comfortable temps, great company and a day of cupcakes. 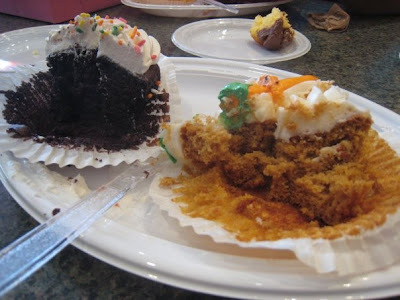 Friends and I took to the streets of Chicago and had ourselves a cupcake crawl. A total of 15 cupcake stops were initially planned but 3 of those locations were closed and the last 2 were just too far apart to squeeze in before the rain came down. So how did we do? Well, considering our cupcake predecessors like We are not Martha (who hit 5 one day plus another 4 on another day), SugarPunk (who hit 3), Chicago Bites (who hit 7), Moore Family Happenings (who hit 5), Leena Eats (who hit 4), and the Yellow Door Paperie (who hit 2), I'm proud to say that What's Cookin, Chicago hit a record where we visited a total of 10 cupcake stops in 5 hours! If it weren't for the rain, I'm sure we would have been able to hit the remaining 5 on our list. 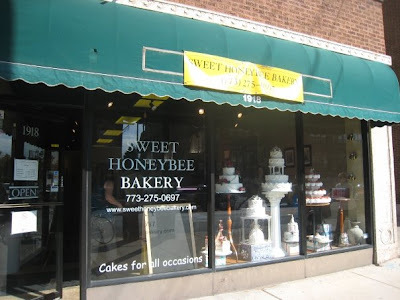 Stop #1: Sweet Honeybee Bakery at 1918 W. Montrose Ave. This was a delightful beginning for our cupcake crawl. 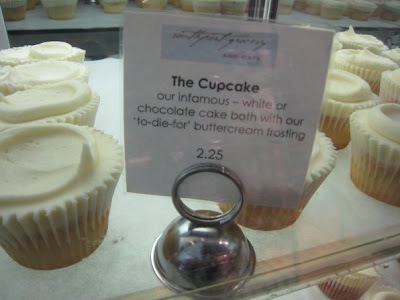 A unique flavor seen at this location is a 'Champagne Cupcake.' 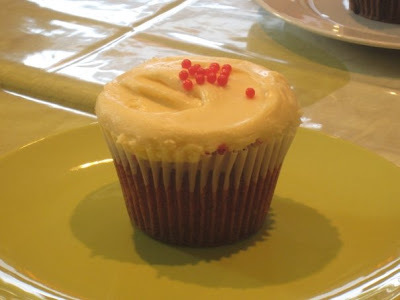 The most popular cupcake here is their Red Velvet. How did What's Cookin, Chicago rate their cupcakes? 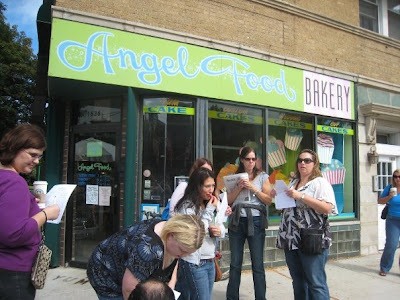 Stop #2: Angel Food Bakery at 1636 W. Montrose Ave. Some other flavors friends tried here were the Boston Cream and Creamsicle. We also found out that Angel Food Bakery will soon be celebrating their 5 year anniversary this coming Wednesday! Be sure to check out their site for month long specials to celebrate with them! How did What's Cookin, Chicago rate their cupcakes? 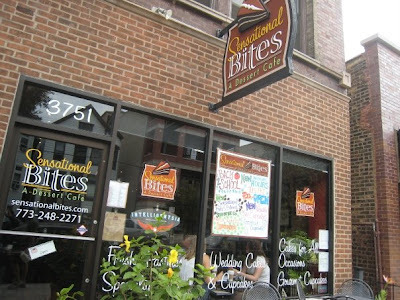 Stop #3: Sensational Bites at 3751 N. Southport Ave. 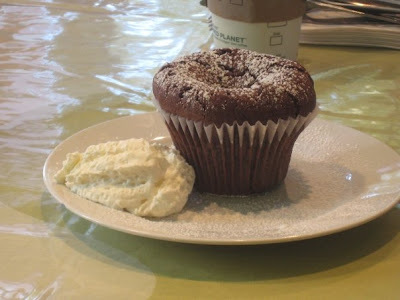 It's a cupcake with a nice crumb, rich chocolate frosting and a perfect amount of creamy vanilla custard as a filling. 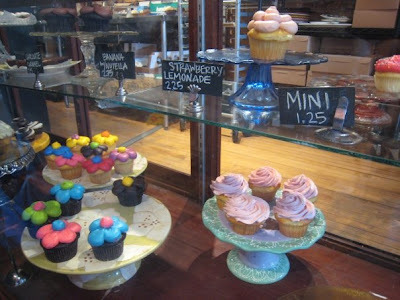 Some other fun flavors offered here include their strawberry lemonade cupcakes and banana nutella cupcakes. How did What's Cookin, Chicago rate their cupcakes? 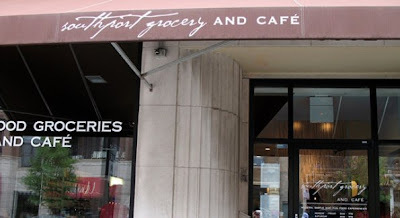 Stop #4: Southport Grocery & Cafe at 3552 N. Southport Ave.
Part cafe, part grocery, the Southport Grocery has a very small offering of cupcakes. Just 2 kinds - vanilla and chocolate - but that seems to be all they need. What was noticeably interesting about these cupcakes is their frosting. More smooth and milky, as opposed to rich and buttery, this was the simplest of cupcakes on our crawl. The consensus of their cupcakes was the frosting being too sweet. How did What's Cookin, Chicago rate their cupcakes? 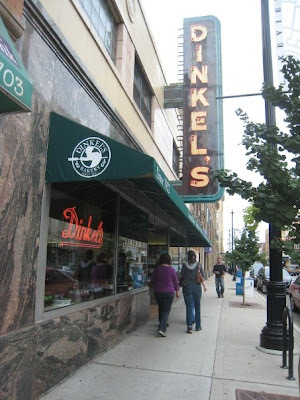 Stop #5: Dinkel's Bakery at 3329 N. Lincoln Ave.
A bakery with quite a history, Dinkel's has been around since 1922. This bakery does a fair amount of business highlighting Bavarian & German baked goods. 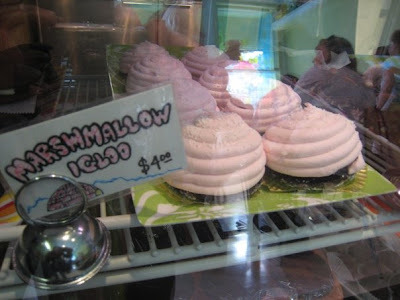 The most unique flavor offered here was their oversized Strawberry Filled cupcakes. 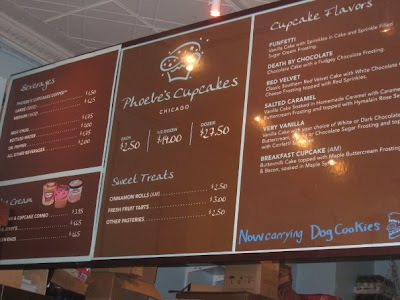 Thanks for my friend Laurel, she treated us at this place with quite a few cupcakes to try including Red Velvet, Carrot Cake, Chocolate, & Custard Filled. How did What's Cookin, Chicago rate their cupcakes? 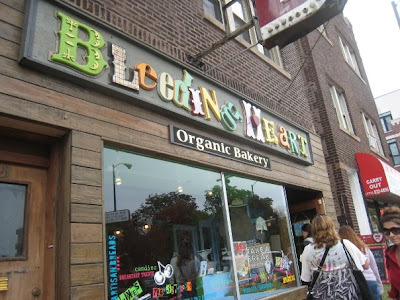 Stop #6: Bleeding Heart Organic Bakery at 1955 W. Belmont Ave.
Out of the 10 cupcake stops we made today, this was probably the most unique when it came to organic cupcake flavors. 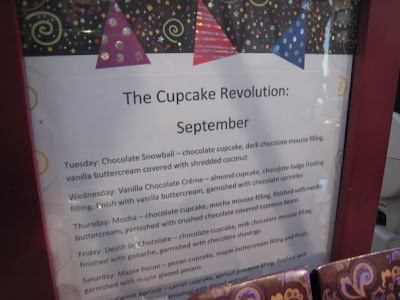 Creating monthly cupcake menus using seasonal ingredients, you can find a plethora of flavor combinations. 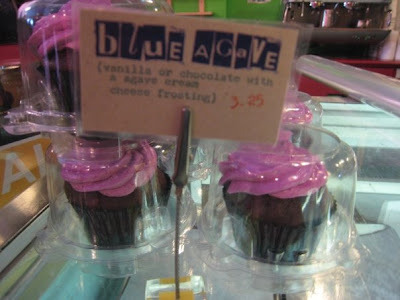 Here's a pic of their 'Blue Agave' cupcakes and for fellow bacon lovers out there, I included a pic of their chocolate dipped bacon just for you! How did What's Cookin, Chicago rate their cupcakes? 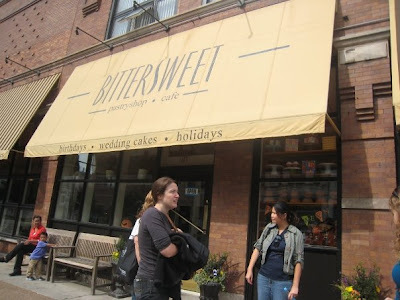 Stop #7: Bittersweet Pastry Shop at 1114 W. Belmont Ave. 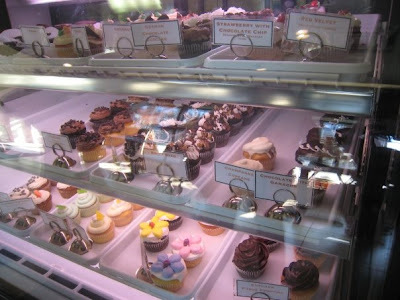 Stepping into Bittersweet Pastry Shop, you'll easily feel like a kid in a candy store. 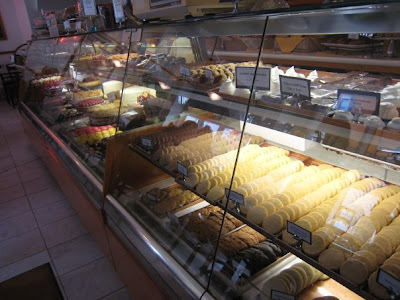 Their bakery cases are filled to the brim with gorgeous cookies and pastries. When it comes to cupcakes, they feature cupakes of the day. 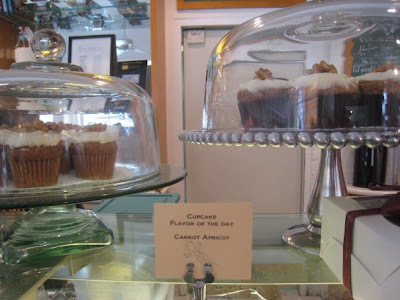 Today, these Carrot Apricot cupcakes were available. 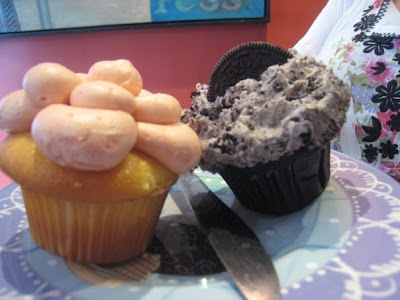 Many of us needed a sugar break and didn't try these cupcakes but we had a couple die hard cupcake crawlers that did. How did What's Cookin, Chicago rate their cupcakes? 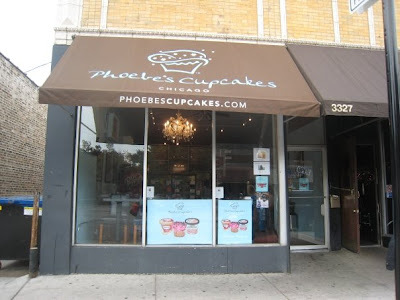 Stop #8: Phoebe's Cupcakes at 3327 N. Braodway Ave.
A fabulous addition to the East Lakeview neighborhood of Chicago, Phoebe's is a favorite of What's Cookin, Chicago members. 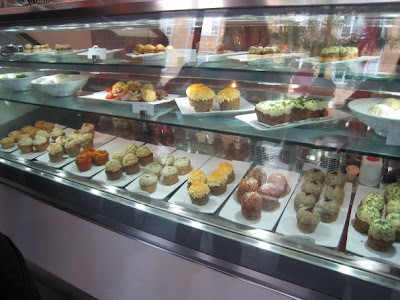 They specialize only in cupcakes so you won't find scones, full sized cakes, or breads here. 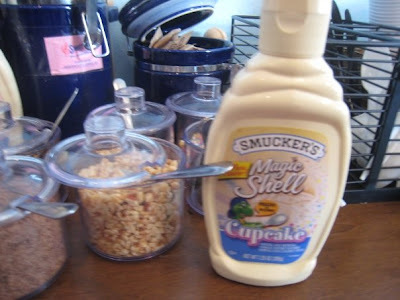 I also have to give Phoebe's props for having a 'sprinkle station' and even offering Cupcake Flavored 'Magic Shell'! 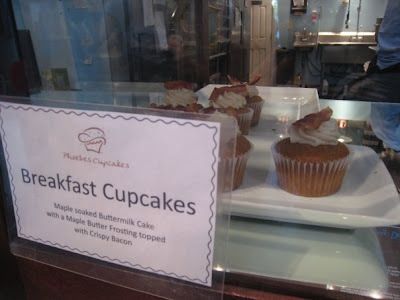 The most popular cupcake here is their Salted Caramel - it was so good, I'm still craving it. So how did What's Cookin, Chicago rate their cupcakes? 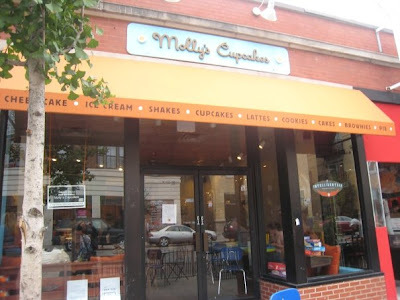 Stop #9: Molly's Cupcakes at 2536 N. Clark St.
We're in the final stretch - are you still with me reading?! 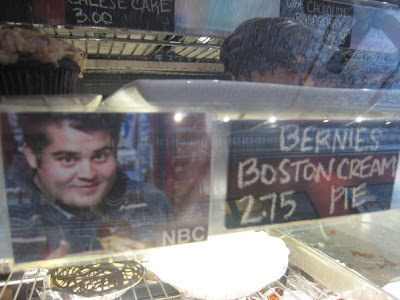 If you don't know who Ron Bennington is, Molly's Cupcakes will tell you. Ron Bennington is a comedian and radio personality. Not exactly a Chicagoan (but a New Yorker by way of Florida) who has a cupcake named after him here. 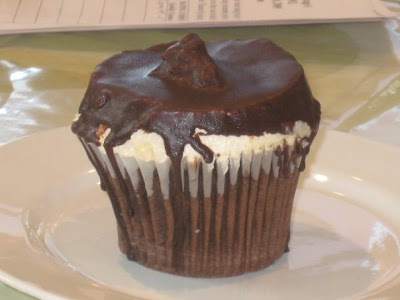 This cupcake is insane - chocolate cake, dense peanut butter filling and topped with a rich chocolate fudge frosting. Oh, and that's not all... it's garnished with crushed Butterfinger bars and a few smatterings of butterscotch baking chips. Wow. 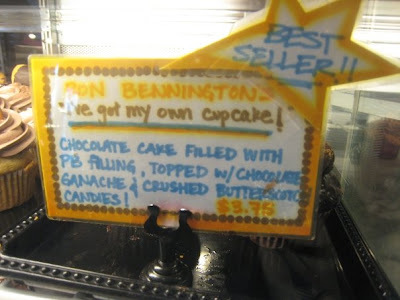 It's no wonder it's the best selling cupcake here at Molly's and it was super rich. Another cupcake we tried here was the Key Lime Pie cupcake, which was a nice contrast. How did What's Cookin, Chicago rate their cupcakes? Stop #10: Meatloaf Bakery at 2464 N. Clark St.
And we made it! 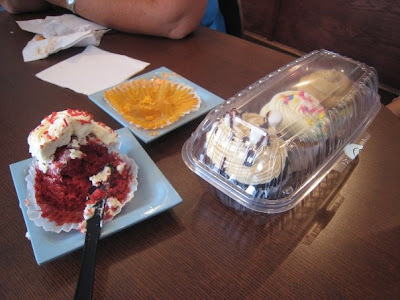 Our final stop to our cupcake crawl was the perfect ending after a day of sweets. 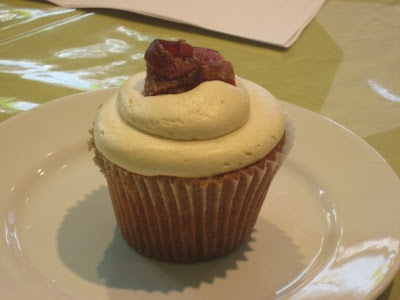 With all the sugar we've consumed today, we welcomed the savory 'cupcakes' of the Meatloaf Bakery. 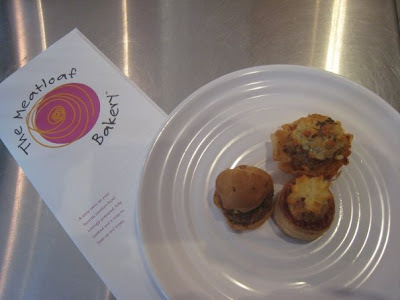 Here, we indulged in savory meatloaves shaped into cupcakes and topped with more savory 'frostings' of mashed potatoes, cheeses and even bell peppers. 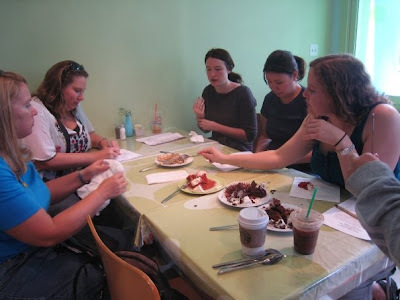 A few of us tried the full sized portions and others tried their 'loafies' which were bite sized versions of the meatloaf. Currently, they are working towards shipping their tasty meatloaves so stay tuned! 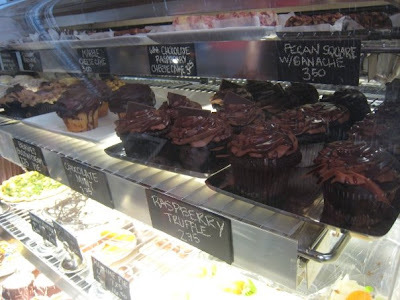 How did What's Cookin, Chicago rate their 'cupcakes'? And there you have it... What's Cookin, Chicago's cupcake crawl of 2009. 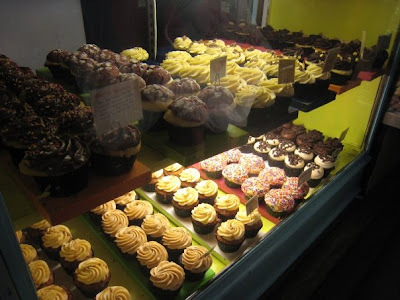 There's talk of doing it again with a whole new set of Chicago cupcake shops so stay tuned. We're hoping to hit up another 10 spots, if not more the next time around! If you love cupcakes (as I'm sure many out there do), these Chicago cupcake shops are ones not to miss. Amazing... my sugar high still hasn't faded but that's okay. The Bears won tonight's game so I don't see my sugar high fading anytime soon! * A special thanks to Laurel, who was kind enough to let me take the above pictures with her camera during the tour. In a rush leaving the house this morning, I brought my camera but left behind my SD card & wasn't able to take pictures - gah! Thank you Laurel... dinner & dessert is on me soon! What a sweet idea! 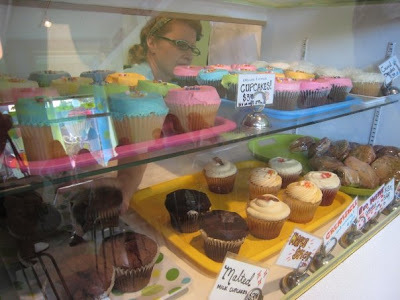 The cupcake crawl sounded like a blast, wish I could've made it. nice cakes...like it very much.. I enjoyed reading this almost as much as you did, doing it. 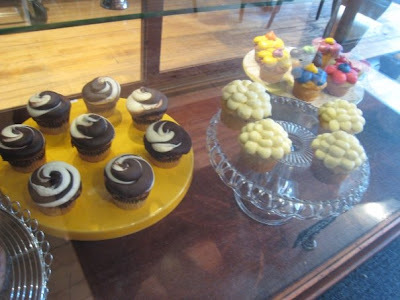 It was amazing to see all those different cupcakes and how pretty everything looked, including the savory cupcakes. That is a great idea to try. I have made meatloaf muffins but I could decorate these with mashed potatoes and I would have a hit. Thanks for sharing this. I really enjoyed browsing the photos. And it makes me hungry. Hmmm..it is so yummy! I like the Malted Milk Chocolate..Hmmm..Delicious! How fun!! 10 cupcake places in one day is a LOT. Wow! What a day! Thanks for filling us in on all of your stops. 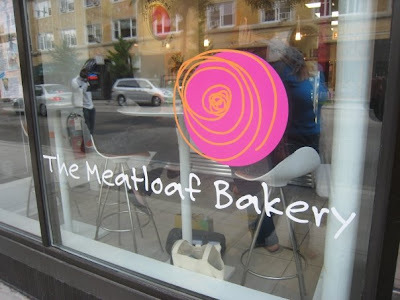 Since I'm on a low carb diet, I really appreciate the info about the Meatloaf Bakery!! Sounds like a big day. 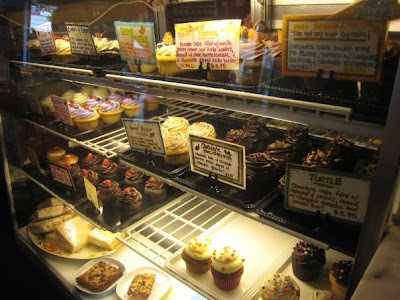 I just love Bittesweet, it's just like what a bakery would be in a movie. That looks like so much fun!! I would love to organize something like this in our town!! Thanks for sharing! This was a great way to spend my birthday, thanks again! Awesome list! 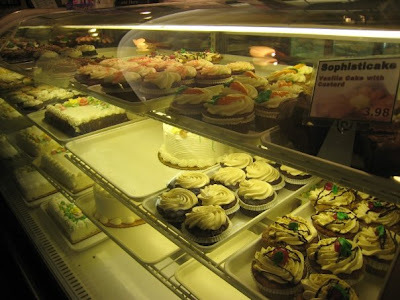 I also really enjoyed Molly's Cupcakes (and can I say I'm not surprised at the low rating of Southport grocery? I didn't care for them much either). what a great food crawl. i would have gone, but it would not have helped the diet! 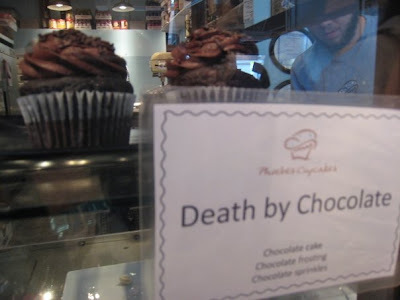 molly's is my personal favorite, we got our wedding cupcakes there last year. though i found out they switched head bakers a while back. sounds like it's still just as good! This is much more my speed than a pub crawl. 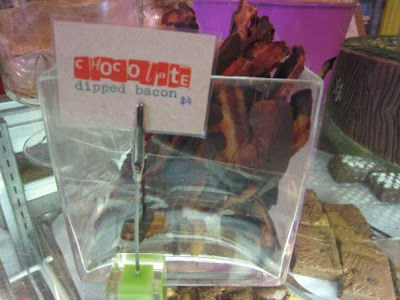 My favorites from your day are: the malted milk chocolate cupcake, and the bacon cheese burger meatloaf cupcake.